At the jam-packed Orphan Black panel at Comic-Con, moderator Dalton Ross started with what we're all wondering most: what's wrong with those Emmy voters? 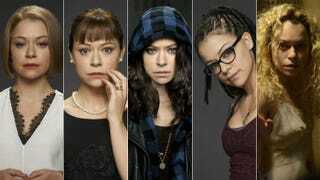 Why didn't the incredible star Tatiana Maslany get that nod? She has a theory. I just feel really lucky to be at this point in history, in television history, making a show like this and in the company of shows like that. The Emmys are lovely and wonderful, but for me it's more hearing the response from the fans and seeing the fan art. Honestly, being in this room, that's why we do it. From there, the conversation shifted to Jordan Gavaris, and specifically to the scene during which Felix tells Sarah, "There's no place for me here," and takes off. Gavaris began, "That was a hard scene." He went on, "The goal is to not plan anything, to be careful [about] how much precision you're applying to the scene and that was something that kind of unfolded very unexpectedly. We knew that we wanted a line in the sand, we wanted a divide. There was gonna be a fracture in the relationship, but we didn't know how it was gonna play out." Gavaris even went as far to say that that moment didn't require much effort on his part. "I didn't have to do anything. Every time I went to perform the scene, I just felt so bad for this poor guy who has been putting himself on the line every time for this girl that he cares a great deal about. And he feels so alone and so alien." And that's not the only rough moment Felix had this season. Remember when Paul came over and forced Felix to mush his fingerprints all over that gun? They screened it and then handed the conversation over to Gavaris and Dylan Bruce. Bruce lamented, "It was a tough part of the job because I have a big man crush on Jordan Gavaris." He added, "My man crush on Jordan Gavaris is almost as much as my crush on Clone Club, so when I read that scene, I was like, 'You guys are gonna hate me.' I thought Paul would be unredeemable after that." Gavaris wasn't about to let Bruce's man crush go unreciprocated. He turned to Bruce and said, "I've gotta say, you did so well being comfortable in that to show everybody – because, you know, you're putting yourself on camera for like millions of people. That was so brave that you got comfortable enough to do that, to show that nasty part of yourself, to show that side. That was amazing!" However, Bruce did point out that back on set, Gavaris unknowingly got a little revenge. Bruce recalled, "Felix wears some high heel boots. We did about 10, 15 takes and every time I flipped him over and pushed him down, that boot kicked me in the exact same spot in my shin. And then Jordan, at the end of the scene, was so into it, he spit on me!" Paul was also due to get pretty brutal with Ari Millen's character, too, but co-creators Graeme Manson and John Fawcett opted out of that one because Millen was so captivating, they wanted to use him more – as in clone-style more. Turns out, Mark is part of Project Castor, the male version of Project LEDA. The finale episode of the second season offered up a slight sense of what Millen is in for, but he said he still doesn't know much beyond that. Millen explained, "I'm still waiting to find out what I'm doing. We've had a couple of conversations and I know a little bit about who I am and about where we're going." Portraying Mark and whoever else is part of his set is going to be a challenge no matter what, but Millen does have Maslany and her clone-playing know-how to back him up. "Tat's one of the most generous actors you'll ever work with and I know if I ever do have questions that she'll be there to answer them." However, he did note, "But, you know, it's a very personal journey, I think, her creating her characters and me creating mine, so I really look forward to it." Moving back to Sarah's Clone Club, Maslany singled out the one deceased clone she'd like to bring back and explore more. "I think Jennifer would be quite an interesting character. We got a very small glimpse of her, but weirdly we sort of saw her whole life in three sequences. We shot that in pre-production before camera and it was this weird day of shooting this woman's life and then losing her." Before moving on, Maslany tossed in, "But Beth, I think, is fascinating," and then that begged the question, is it possible we'll see more of Beth, perhaps in a flashback? Manson hinted, "Nothing is off the table." Fawcett added, "We've talked about Beth's story as part of the mythology of the series since the beginning." He continued, "I think that at some point there is a definite chance that we may see Beth." Manson jumped back in, "I think there's probably a twist on what happened with Beth that we don't know yet." Fawcett confirmed, "Well, there's definitely a twist." Neither Manson nor Fawcett would outright say it, but it did seem like Beth could also pop up in that Orphan Black comic book series. They revealed, "There will be original material and things, relationships and unseen backstory in the comic books." As for living clones Maslany would love to explore more, that honor goes to Tony. "I think we got the very littlest bit of him and he just offers so much as far as identity and gender identification and exploration and expression, and you know, our show's about individuals and about people and how they express themselves and Tony offers all of that." It's also hard not to wonder about the clones' parents, specifically Cosima's. This poor girl is practically dying and yet her parents never even bother to check on her. Someone joked that they're just out in Berkeley living their lives and then Maslany laughed and threw in, "They don't own a car, so they're like walking really slow." There were laughs all around, but apparently Manson and Fawcett did once consider throwing Alison's mother into the mix. The gang agreed that if that ever happens, Catherine O'Hara or Mimi Rogers would be the best options for the part. And speaking of Alison, Kristian Bruun is especially pumped to tap back into a more congenial, loving relationship. "I think it's great to see Alison and Donnie working as a team after two seasons of us bickering and fighting, glueing each other, things like that." He added, "It's gonna be so much fun exploring our love that rekindled and what we do when we work as a team." Before wrapping up, Maslany divulged the clone she feels connected to most. She insisted that they're all part of her, but that Cosima's the one that she relates to more than any other. "She's kind of focused and really passionate about what she does and loves people." However, Maslany's very own mother sees her in Sarah more. Maria Doyle Kennedy recalled Maslany's mother's visit to set. "Tatiana's mom was visiting the set one day and I was asking her, how does she feel about Tatiana playing all these different people. It's kind of crazy. She said, 'Well, the really crazy thing is when I'm watching it, when I see Sarah, she sort of looks the most like Tatiana'" She continued, "So I'm watching the episode and then every time Sarah disappears, I [remember] her [mom] going, 'I wonder when Tatiana's coming back.'" Kennedy added, "She's so bloody good, her own mother doesn't recognize her!" Damn right. And that's why Maslany deserved that Emmy nomination. High hopes the third time's a charm.